Around the wider world of golf: Yani Tseng defended her title at the Women's British Open to nail 4 of the last 8 majors and become the youngest player, male or female, ever to win 5 majors; Olin Browne got his first major ever at the U.S. Senior Open on the Champions Tour; Simon Dyson won the ET's Irish Open, which got him into next week's WGC-Bridgestone; Kathleen Ekey won the Alliance Bank Golf Classic on the LPGA Futures Tour; and J.J. Killeen won the Utah Championship on the Nationwide Tour. 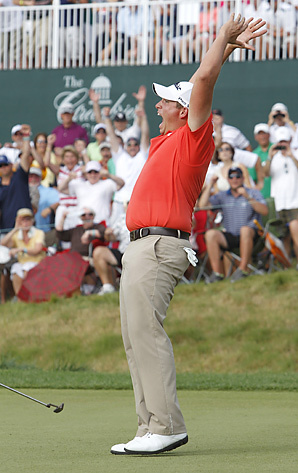 Scott Stallings looks to be slightly happy, doesn't he? That's because him making (and winning) the Greenbrier's 3-way playoff wasn't nearly as big a surprise as Bob Estes making the playoff... or Anthony Kim not making it. After blistering the course with a 62 Saturday, Kim struggled in with a birdie-free 74 and vanished from the scene. Still, Kim's showing signs that he's healed from his thumb surgery and could factor in the rest of the season. Some may question whether Schwartzel should be considered a rookie given his ET experience, but he's still a PGA Tour rookie. At any rate, it's a pretty impressive showing by the rookies this year. And Scott Stallings walked off with the win. As the rookie class does it again. The photo came from this golf.com story.